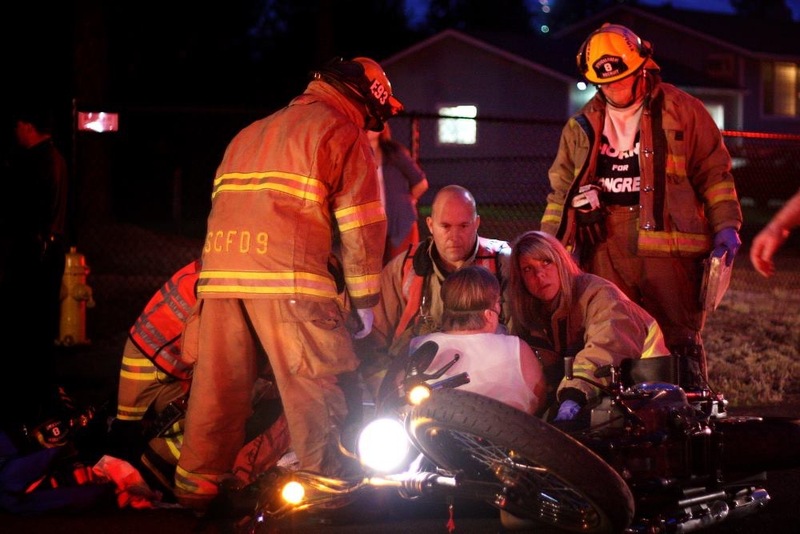 Rhonda Nowak (center right) assists fellow EMTs and firefighters at the scene of an emergency. If you were ever choking on a hastily swallowed snack, Rhonda Nowak is the PayneWest employee you’d want nearby. Not only is she the Client Relations Director in Benefits Planning at PayneWest and knows everything about company medical benefits, she’s also a trained EMT with over a decade of experience. It’s safe to say she knows the Heimlich Maneuver pretty well. Rhonda didn’t have a medical background when she became an EMT. She didn’t even think of it as a career path (she still loves her benefits work), but she was still drawn to it, nonetheless. Spontaneous coronary artery dissections are commonly known as SCAD, and are still a bit of a medical mystery. Commonly experienced by women, they can come on seemingly out of nowhere, and many are left wondering about their health and capabilities afterwards. When Rhonda experienced her SCAD, she was treated by a EMT medical team who were able to bring her comfort and assistance during a terrifying time in her life. She came out of the surgery wanting to give back to provide the same sense of aid to others. Rhonda has lived outside Spokane, Washington for most of her life. She knows her neighbors in Nine Mile Falls and her children’s friends all over the area. When she goes out on calls, there’s a chance she’s going to know the person she’s heading to help. Many of the members of her “fire family.” as Rhonda calls them, are the same age as her three sons, and she does tend to naturally fill the “mother hen” role at the firehouse. Her sons Brennan (28), Riley (24), and Keaton (19) have all moved out of the family home, which is good, since Rhonda is at the firehouse most Friday nights. Her husband, Greg, is also off on calls. After Rhonda became a volunteer EMT, Greg decided to become a firefighter at the same station. They frequently work the same shifts. As if becoming an EMT wasn’t enough, five years ago, Rhonda expanded her expertise and trained and was certified as an Advanced EMT. It took nearly five months of study after work and on weekends. She’s now certified to handle certain medications and start IV’s on patients. With a large rural area to cover (nearly 350 square miles) having an advanced training has proved extremely valuable. She’s there to not only assist someone medically, but also make sure that a home or property is protected after an event like a wildfire or accident. It can be extremely difficult, but rewarding. “Firefighters and EMTs act as a huge support system for their teammates,” she said. “Sometimes the younger recruits don’t know how to process difficult calls, and they have trouble when they take the job home afterwards.” It’s something Rhonda tries not to do — even while tapping into her natural instinct to take care of people. As one of the oldest members of her team, Rhonda still holds her own among the EMTs and firefighters and finds strength deep inside that she never expected. Rhonda had to conquer her fear of heights for her EMT certification, and proved she could climb a ladder in full gear and get the job done. How long is Rhonda going to be on the EMT team? Only time will tell.